For about an hour, before the movie crashes and burns in a bonfire of exaggeration and stupidity overkill, “Olympus Has Fallen” shapes up as a fun ride. I’m not a huge fan of director Antoine Fuqua (“Training Day” was massively overrated in my opinion), but the guy knows how to pump the action pedal. Hell, he floors it. We’re in Washington, a year and a half after Secret Service agent Gerard Butler made the tough choice to save the life of President Asher (Aaron Eckhart) in a car accident even though it meant losing the First Lady (Ashley Judd). Now Butler is stuck at a desk job at the Treasury Department when out of nowhere terrorists take the president and his advisors hostage in the bunker beneath the White House. Could Butler be at the right place at the right time? Will he be able to sneak into the White House and save the day? Obviously. To be fair though one doesn’t approach a movie like this expecting Shakespearean drama. Unlike some films with higher ambitions, “Olympus” pretty much delivers what it promises: action, suspense, destruction and a bit of drama. One of the two stars I’ve given this guilty pleasure goes exclusively to Morgan Freeman as the Speaker of the house. Eckhart is listed as The President, though I saw no evidence of anyone in control. 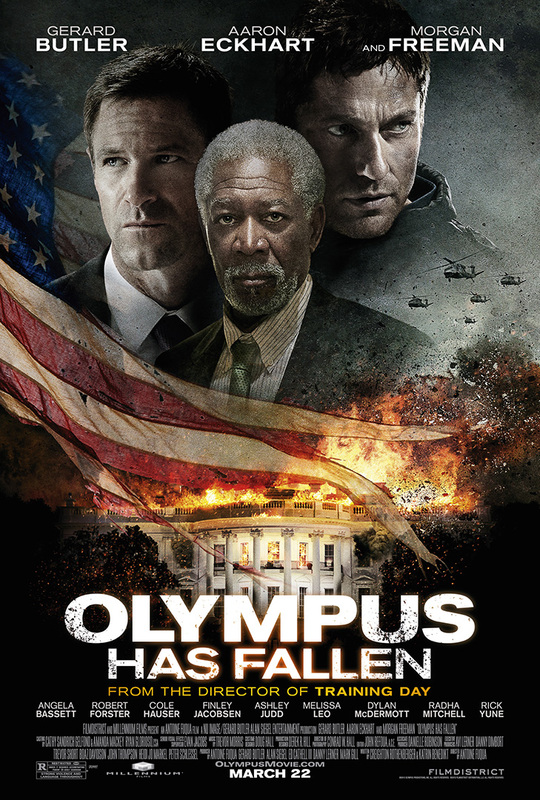 At the end of the day, “Olympus has Fallen” has all the signs of a hit. And for this kind of genre piece it’s not bad. It all has to do with your expectations. rahibe l movie ktir hebayta fiya exagerations chwe bass ka suspence moukhifeeee w majbour tdal mrakaz kel l wa2et ma fik tzi7 nazarak.